In this article we’ll examine bone density reporting and how it has evolved over the years. Bone density testing is a relatively new test. Reimbursement for bone density tests wasn’t approved until the mid 1990s. DXA machines became the primary method used to measure bone mineral density. Initially, there was little to aid physicians who reviewed bone density scans, as the process was largely manual. Now there is a cloud based solution. We’ll take a brief trip, chronologically, through the advances in bone density reporting. Improvements in reporting will be discussed. Quality, convenience, and cost improvements will also be noted. Manual reporting makes use of pencil and paper or word processors to generate reports. Desktop solutions are first generation software package produced by the DXA equipment manufacturers. Cloud (web) based solutions, such as BoneStation. Radiologists often use another method to review bone density scans. This involves the use of PACS with dictation or transcription. We’ll look at this option in more detail in a future article. A bone density scan is a somewhat unusual test. It has the qualities of both an imaging procedure and lab test. The scan consists of an image plus numerical data, such as bone mineral density (BMD), t-score, and z-score. The process of evaluating bone density scans is referred to as reading, reviewing or interpreting bone density scans. Physicians are specially trained to read bone densitys scans. A reviewing physician typically looks at both the scan image and numerical data. It is common to compare current scans with a patient’s prior scans. A typical report may include the numerical scan data, an assessment (for example, osteoporosis, osteopenia, or normal), recommendations, and a statement about change in bone mineral density (BMD) – assuming the patient had prior scans. In the beginning, bone density reports were created manually. DXA machines produce printouts of scans. A printout contains a scan image and tables of numbers, including bone mineral density (BMD), t-score, and z-score. The data was typically re-entered into a word processor and an assessment was typed in. The scan image was usually omitted, since it was difficult to get the scan image into the report. Data entry of the bone density quantitative data (BMD, t-score, z-score) is error prone. The only way to compare a scan with prior scans is to have the printouts of the prior scans, and this involves manual labor to pull old charts. Storage of paper scans and reports can be costly. To calculate change in BMD, during review, is also be labor intensive. It was difficult to include images in a report. Eventually the DXA manufacturers implemented the DICOM standard. DXA machines could then transmit bone density scans to other computers. Soon after, the DXA manufacturers provided desktop software applications that could communicate DICOM and receive bone density scans. A physician could install the desktop software on his office PC and have bone density scans transmitted to it. Using the software, he could then create a bone density report. The report could be stored in an electronic format – a data file. Quality was improved mainly due to elimination of data entry. The software could extract the quantitative data from the DICOM transmission and place it in the report. Reports took an electronic form and could be stored that way. Desktop reporting also introduced new problems. Where are electronic reports stored? Would they remain on the PC of the reading physician? What if there are multiple reading physicians? How could one recall an old report easily? Even though reports were stored electronically, the desktop applications offer no easy way to access an old report. 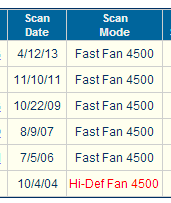 What about privacy or security issues with storing scans (in DICOM format) and reports on a PC hard disk? How are reports backed up? The desktop software also represented an additional cost – both direct and hidden. The main direct cost was the software itself. The DXA manufacturers offered the software for purchase. Hidden costs included addressing the problems described above. Additional tools and infrastructure are need to backup electronic data, store reports on a network, organize reports (in a database) to be easily searchable, and provide security and privacy of electronic data. The side effects of introducing desktop software vary depending on the number of bone density tests performed. A high volume provider may have an IT department in place and the infrastructure for addressing storage, backup, and security may exist. A low volume provider may have to hire expertise in these areas. The “cloud” solution is BoneStation. The term “cloud” is today’s common lingo for storing data out on the Internet. Scans are transmitted, via DICOM, to BoneStation. 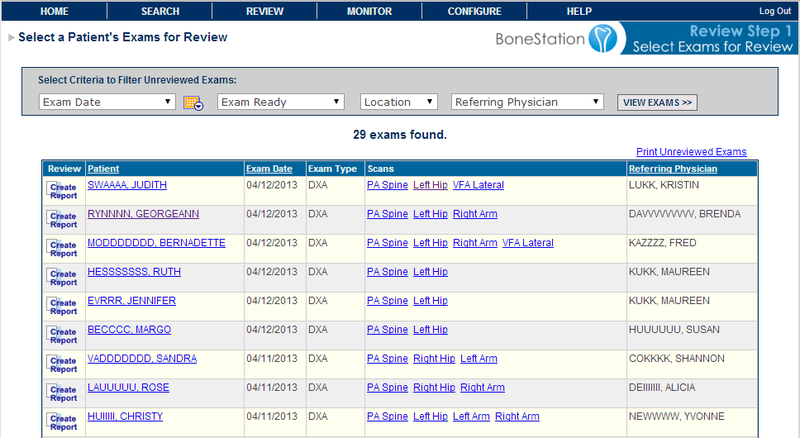 Reviewing physicians log into BoneStation’s web application and can view scans – images and data – and create reports. BoneStation solves the problems of the manual and desktop methods. Scan data (BMD, t-score, z-score, etc) is automatically extracted and made available on the report. No data entry is needed. BoneStation also makes prior scan images and reports available during the review process, which was a shortcoming of the desktop solutions. New problems introduced by the desktop software are also addressed. Reports are stored centrally, in an enterprise class database. The database is backed up, which prevents data loss. An easy to use search mechanism provides the ability to easily search for and view old reports. Access to BoneStation is secure. One must be granted authorization to access BoneStation in order to see bone density data. Data transmitted to and from BoneStation is encrypted, which maintains privacy. Prior scan images and data are available – even during review. 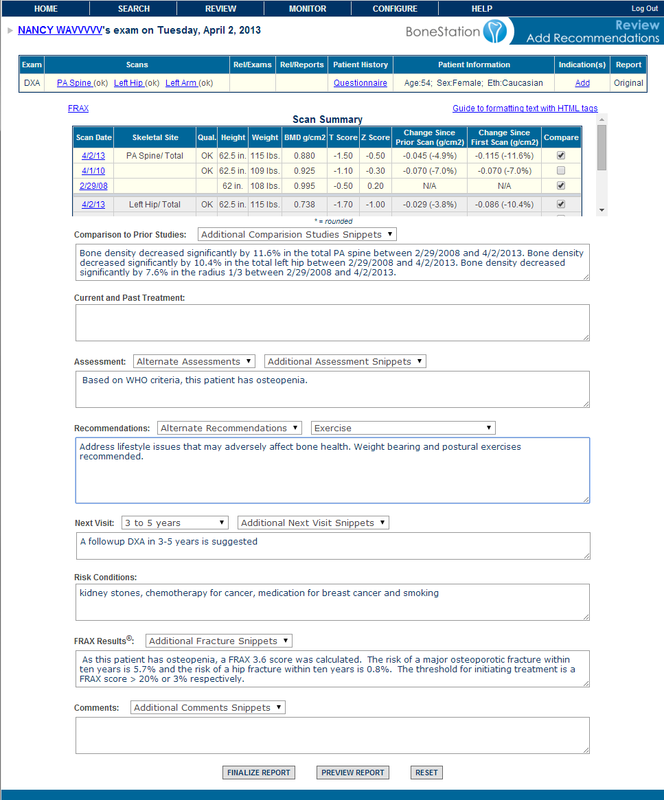 Old medical history questionnaires are also available, which is useful with FRAX. Cloud based solutions often solve a wider spectrum of problems while also being more cost effective. BoneStation addresses issues of quality, security, data integrity, and privacy. It is easy to install and use, requiring simply a web browser and internet access. Costs are typically lower with cloud based solutions. Startup costs are low and cloud solutions are typically offered on a per usage basis. BoneStation is offered on a cost per report basis. In addition, BoneStation addresses hidden IT costs, such as storage, backup, and privacy and there are no upgrade and maintenance fees. While bone density testing is relatively new, there are modern solutions available for reporting. The initial desktop solutions addressed quality issues related to data re-entry. The most recent solutions are more comprehensive and address clinical, quality, and information technology problems while keeping costs low. 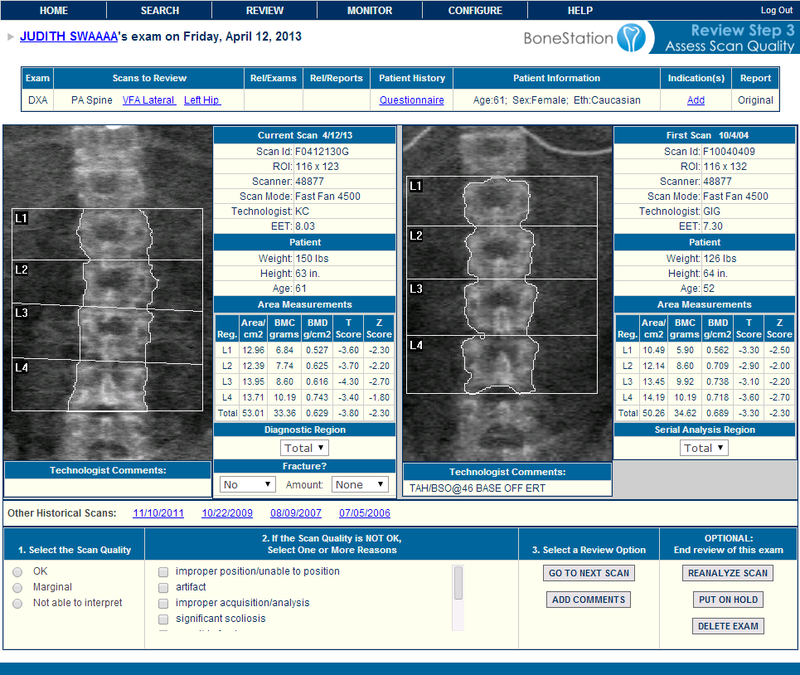 BoneStation – cloud-based bone density report for DXA. Reading bone density scans on a mobile device with BoneStation.